OPEN BOX - Like New&###xA0;Items! Enjoy big discounts for our OPEN BOX - Like New items! All our Opened Box items are&###xA0;in great condition each of them is tested and verified by professional logistic&###xA0;teams, in most cases you'll hardly notice the difference between our opened box items to equivalent new items, sometimes the product box do not meets brand new items standard, but besides that you will own a great product and in a competitive price. 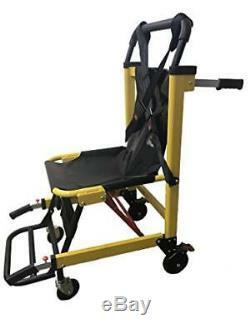 LINE2design EMS Stair Chair 70002-Y Medical Emergency Patient Transfer - 4 Wheel. 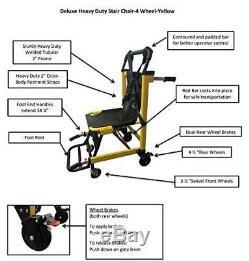 The LINE2design EMS Deluxe Heavy Duty Emergency Evacuation 4-Wheel Stair Chair has an extra sturdy 2 tubular welded frame in bright yellow for easy visibility. 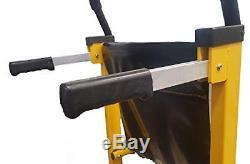 The Stair Chair comes with a heavy duty black all-impervious vinyl seat and back rest that is durable and easy to clean. 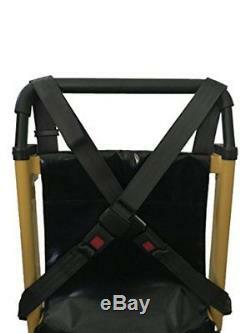 A heavy duty, 2 cross-body, quick release restraint straps provide extra safety to the patient during transport and while moving up or down stairs. This stair chair features two 4.5" rear wheels and two 3.5" swivel front wheels for easier transportation on most surfaces. 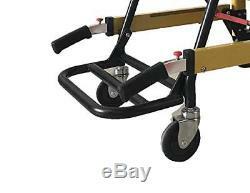 The foot rest and four wheels allow comfortable transportation on flat surfaces. The front two handles on the evacuation stair chair, telescope out to 14 ¼, and lock into place to provide the best possible leverage when lifting the patient. When transporting a patient up and down stairs always use two trained operators with the Heavy Duty 4-Wheel Evacuation Stair Chair. Folds compactly for efficient storage. Bright yellow frame for high visibility. Head-end and foot-end lift handles. Rear wheel brakes (both wheels). Black all-impervious vinyl seat/ back rest. 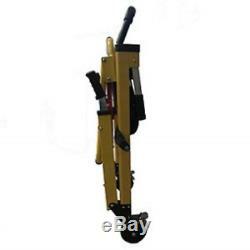 Heavy-Duty 2 tubular welded frame. Padded and contoured rear bar for operator control. 2 Heavy-Duty cross-body safety restraint. 2 Lower leg safety strap. 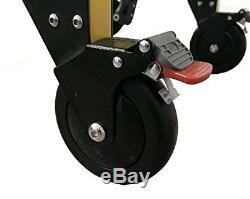 3 ½ Swivel front wheels. We do NOT accept P.
We guarantee that your issue will be solved quickly. We usually respond within 24 hours on weekdays. The item "LINE2design EMS Stair Chair 70002-Y Medical Emergency Patient Transfer 4 Wheel" is in sale since Saturday, November 17, 2018. This item is in the category "Business & Industrial\Healthcare, Lab & Dental\Medical, Lab & Caregiving Furniture\Stretchers & Backboards".